Dr. Khodja was retained as a research scientist at CIPR on Aug. 18, 2013. Prior to joining CIPR, He was a postdoctoral fellow in the Dept. of Mathematics and Modeling at Schlumberger-Doll Research, Cambridge, MA, USA, during which he was the lead contributor in the development of an effective Bayesian methodology for the design of large experiments and surveys that optimally maximize model-parameter resolution for imaging purposes. Ph.D., Physics, North Eastern University, USA, 2009. M.Sc., Physics, KFUPM, KSA, 1998. B.S., Theoretical Physics, University of Constantine, Algiers, 1994. Wave-metamaterial interaction, far-field sub-diffraction-limited imaging, control of electromagnetic and mechanical waves, and digital rock physics. 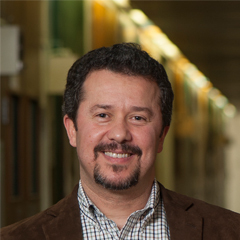 He leads the CT imaging research group, applied and fundamental research in electromagnetics. R. Khodja, M. D. Prange, and H. A. Djikpéssé, “Accounting for Seismic Radiation Anisotropy in BayesianSurvey Designs” Geofizika 33, pp. 79-99, DOI: 10.15233/gfz.2016.33.1, 2016. A. Djikpéssée, M. R. Khodja, H. Menkiti, M. D. Prange, and S. Duch_enne, “Bayesian Survey Design to optimize Resolution in Waveform Inversion” Geophysics 77 (22), pp. 81-93, 2012. R. Khodja, M. D. Prange, and H. A. Djikpéssée, “Guided Bayesian Optimal Experimental Design, Inverse Problems” 26, 055008, 2010. A. Marengo, M. R. Khodja, and A. Boucherif, “Inverse Source Problem in Non-homogeneous Background Media: Vector Formulation and Antenna Substrate Performance Characterization“, SIAM J. App. Math.,69 (1), pp.81-110, 2008. R. Khodja and E. A. Marengo, ” Radiation Enhancement Due to Metamaterial Substrates from an Inverse Source Theory“, Phys. Rev. E 77, 046605, 2008. A. Marengo and M. R. Khodja, “Generalized Power-spectrum Larmor Formula for Extended Charged Particle Embedded in a Harmonic Oscillator”, Phys. Rev. E 74, 036611, 2006. Abdel-Jalil, M. R. Khodja, and A. Al-Suwayyan, “A Physical Model for the Distribution of Ions and Electrons in Laminar Premixed Hydrocarbon Flames”, Arab. J. Sc. Eng. 26/2A, pp.127-135, 2001. Distinguished Faculty, Deanship of Faculty Affairs, KFUPM, KSA. Teaching/Research Assistantship, College of Arts and Sciences/College of Engineering, Northeastern University. Teaching/Research Assistantship, College of Sciences, KFUPM, KSA.